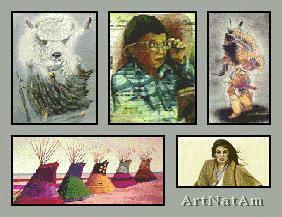 Welcome to the Native American Artists' Home Page! Please take the time to enjoy the unique art of these truly American Artists. Indian Art is traditionally deeply spiritual and symbolic, having its own metaphysical power. Only Native American Artists are presented at this site. The variety and quality of their work speaks for itself. This is a juried collection of works. Please feel welcome and enjoy yourself! Please note that all Art displayed is Copyrighted by the individual Artist. The Art Work may be downloaded and posted on other sites, if credit is given to the artist and a link provided back to the Artist's Exhibit. However, the images may not be modified or cropped in any manner, or used commercially or for profit without the expressed written consent of the Artist and this Site. 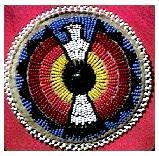 What is a Native American Artist? This site best viewed with click to download. All Original Art - Copyright © by Individual Artist - All Rights Reserved. Web Page & Graphics - Copyright © Computer Focus - All Rights Reserved.